Every six seconds, for millions of years, comets have been colliding with one another near a star in the constellation Cetus called 49 CETI. Over the past three decades, astronomers have discovered hundreds of dusty disks around stars, but only two — 49 CETI is one — have been found that also have large amounts of gas orbiting them. Young stars, about a million years old, have a disk of both dust and gas orbiting them, but the gas tends to dissipate within a few million years and almost always within about 10 million years. Yet 49 CETI, which is thought to be considerably older, is still being orbited by a tremendous quantity of gas in the form of carbon monoxide molecules, long after that gas should have dissipated. "We now believe that 49 CETI is 40 million years old, and the mystery is how in the world can there be this much gas around an otherwise ordinary star that is this old," said Benjamin Zuckerman, a UCLA professor of physics and astronomy and co-author of the research, which was recently published in the Astrophysical Journal. "This is the oldest star we know of with so much gas." Zuckerman and his co-author Inseok Song, a University of Georgia assistant professor of physics and astronomy, propose that the mysterious gas comes from a very massive disk-shaped region around 49 CETI that is similar to the sun's Kuiper Belt, which lies beyond the orbit of Neptune. The total mass of the various objects that make up the Kuiper Belt, including the dwarf planet Pluto, is about one-tenth the mass of the Earth. 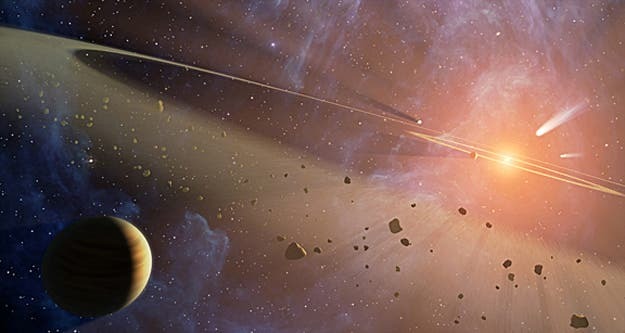 But back when the Earth was forming, astronomers say, the Kuiper Belt likely had a mass that was approximately 40 times larger than the Earth's; most of that initial mass has been lost in the last 4.5 billion years. By contrast, the Kuiper Belt analogue that orbits around 49 CETI now has a mass of about 400 Earth masses — 4,000 times the current mass of the Kuiper Belt. "Hundreds of trillions of comets orbit around 49 CETI and one other star whose age is about 30 million years. Imagine so many trillions of comets, each the size of the UCLA campus — approximately 1 mile in diameter — orbiting around 49 CETI and bashing into one another," Zuckerman said. "These young comets likely contain more carbon monoxide than typical comets in our solar system. When they collide, the carbon monoxide escapes as a gas. The gas seen around these two stars is the result of the incredible number of collisions among these comets. "We calculate that comets collide around these two stars about every six seconds," he said. "I was absolutely amazed when we calculated this rapid rate. I would not have dreamt it in a million years. We think these collisions have been occurring for 10 million years or so." Using a radio telescope in the Sierra Nevada mountains of southern Spain in 1995, Zuckerman and two colleagues discovered the gas that orbits 49 CETI, but the origin of the gas had remained unexplained for 17 years, until now.